Earlier in the year, we published articles on two legendary adventure sector brands: Petzl and Patagonia. We will soon have more articles in that series. But then we thought, where would these adventure brands and enthusiasts be without true pioneers leading the way? Here’s the first in a new series about these true pioneers: the story of Sir Ernest Shackleton. At the turn of the previous century, Antarctica represented the last great unexplored wilderness. Shackleton was one of the leading British figures in this brave new era of exploration. With advances in communication, including ice-breaking ships, helicopters, planes and survival gear, Antarctica became somewhat more hospitable after World War II, for scientists at least. But, for Shackleton on his first voyage, in 1901, it was the equivalent of a Moon landing. It was new, almost uncharted territory, except for the coast. His first voyage to the region was serving as third officer aboard HMS Discovery, the first British-funded expedition to Antarctica since James Clark Ross’s mission sixty years earlier. The British National Antarctic Expedition, generally known as the Discovery Expedition (1901- 1904) was jointly organised by the Royal Society and the Royal Geographical Society (RGS). The expeditions mandate was to advance scientific knowledge, in the tradition of great explorers and scientists, at a time when nationalistic tensions were high amongst the European powers. A successful Antarctic mission was good for the country’s national standing. Although the expedition had the full support of the Royal Navy, they had few crew or officers to spare. Growing trouble in Europe and with Japan prevented them from using many resources for science. It was up to the Merchant Navy to supply the manpower. Shackleton was a third officer in the Union-Castle Line, where he met an army lieutenant, Cedric Longstaff, on the Boer War troopship, Tintagel Castle, in March 1900. Cedric’s father, Llewellyn W. Longstaff was the main financial backer of the Discovery Expedition. Once they were introduced, impressed by Shackleton’s keenness for adventure, Longstaff ensured he was on the voyage. Captain Robert Scott was leading and happy to have him onboard, including him in the party that reached a southern latitude of 82° 17’, in an attempt to reach the Pole (the farthest south ever reached, at that point in time). The expedition made some remarkable discoveries in biology, zoology, geology, along with the discovery of Antarctica’s longest river, the Cape Crozier Emperor penguin colony, and route to the South Pole. Shackleton had to return to England, on account of bad health, but not before he vowed to return to this vast frozen continent. Shackleton was the first ranking officer to return to England, after a period of recovery in New Zealand. He consulted with the Navy and a Swedish Expedition on their relief efforts but ultimately drifted in his career, until he decided it was time to return to Antarctica, with the support of wealthy industrialists, including the Guinness baron, Lord Iveagh. HMS Nimrod set sail from Lyttelton Harbour, New Zealand on 1 January 1908, landing at Cape Royds, Antarctica, one month later, near Scott’s Discovery base, in McMurdo Sound. The aim was to reach the South Pole and Southern Magnetic Pole, both of which had never been attempted. The “Great Southern Journey” sadly didn’t reach the Pole, with the expedition running out of food, but they did get to a latitude of 88° 23′ S, only 112 miles from the Pole. They did climb Mount Erebus, located the Magnetic Pole and were the first people to travel across the South Polar Plateau. Shackleton was a modern leader, skilled at supporting and motivating his men, making him a hero long before he returned to England, where he wrote a book about his experiences and toured the lecture circuit. In 1909, he was made a knight in the Birthday Honours list of King Edward VII. His heart was never in staying at home, in business or lecture tours. Antarctica owned a part of his soul, and despite the Pole being reached by Roald Amundsen (a Norwegian) in 1912, there was still one journey that no one else had accomplished. Crossing Antarctica. From the Weddell Sea, across the continent with sled dogs, to McMurdo Sound, on the other coast. He raised considerable sums from private backers and picked a crew of 56, divided between two ships, with HMS Endurance carrying Shackleton and the team who would attempt the crossing. It became known as the Endurance Expedition. The second ship, the HMS Aurora carried a crew that would lay supply depots as far inland as the Beardmore Glacier, ensuring Shackleton’s party could complete the 1,800-mile journey. The Navy gave the ships permission to leave British waters, despite the outbreak of World War One on 3 August 1914. Before Endurance could reach the coast, at Vahsel Bay, it got caught in ice floes, trapping the ship. It stayed locked in ice until spring (September 1915), when the thaw put extreme pressure on the hull, forcing them to abandon ship, watching it sink two months later. For over a year, his crew made camp on ice floes, hoping they would be carried to Paulet Island, where there were stores and supplies of food. They got within 60 miles, but the ice was impassable. Eventually, using lifeboats, they reached Elephant Island, after 492 days on ice and a further 5 difficult days at sea. This wasn’t a permanent solution. Shackleton’s men were still 720 nautical miles from whaling stations in South Georgia, where they could seek help and new supplies. 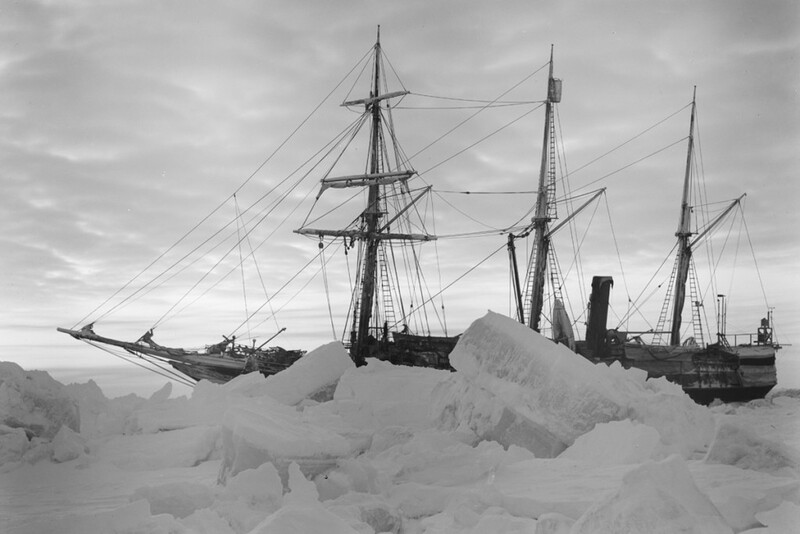 Shackleton picked a crew of five and enough supplies for one month to attempt to get help for the rest of his men. Despite hurricane-force winds they landed on the unoccupied southern shore of South Georgia, a land so inhospitable that the next explorer to cross it, using the same route, didn’t do so until 1955. Fortunately, after 36 hours crossing the island, Shackleton was able to convince the Chilean government to send a ship alongside a British whaler that rescued the stranded Elephant Island crew on 30 August 1916. Everyone from Endurance survived, with only three killed amongst the Aurora crew. Despite not making the crossing he had dreamt about, Shackleton still returned a hero. His health meant he couldn’t enlist in the army, although he was given honorary roles. After the war, he quickly grew tired of the lecture circuit. A former school friend, John Quiller Rowett, funded his final “oceanographic and sub-antarctic expedition”, which departed England in 1921. Shackleton was not in perfect health.